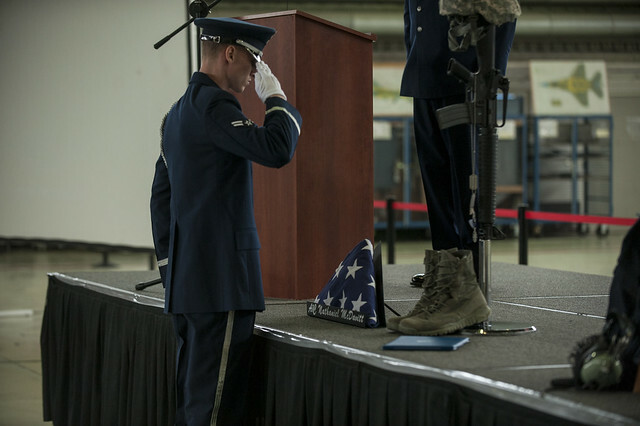 SPANGDAHLEM AIR BASE, Germany -- More than 150 Airmen from the 52nd Fighter Wing gathered in Hangar 2 to say goodbye to a fellow Airman who passed away April 22, 2016. U.S. Air Force Airman 1st Class Nathaniel H. McDavitt, an F-16 Fighting Falcon tactical aircraft maintainer with the 52nd Equipment Maintenance Squadron, was killed in a weather-related incident April 15, 2016, while on deployment in Southwest Asia. "We share in the sorrow felt by Airman McDavitt's loved ones, and we will never forget the valuable contributions he made to our country and the impact he has left on our unit," said U.S. Air Force Maj. David Marce, 52nd EMS commander. "Nate was not only a great Airman, but he was a great person who always had a smile on his face. We keep his family in our hearts and minds during this most difficult time." The Glen Burnie, Maryland, native was among the more than 300 Airmen and pilots from the 480th Aircraft Maintenance Unit and 480th Fighter Squadron deployed in support of Operation Inherent Resolve. "Losing any of our Air Force family members is tragic, especially one so young," said U.S. Air Force Col. Joe McFall, 52nd Fighter Wing commander. "He was an excellent maintainer who was well liked by his teammates and recognized for his model work ethic with EMS Airman of the quarter recognition in 2015. I send my heartfelt condolences to the McDavitt family and those friends and Air Force family members among the 52nd EMS and throughout the base who knew Airman McDavitt well." McDavitt is survived by his wife, parents and siblings. Photos from the ceremony can be seen at the photo set on the Spangdahlem Flickr page.